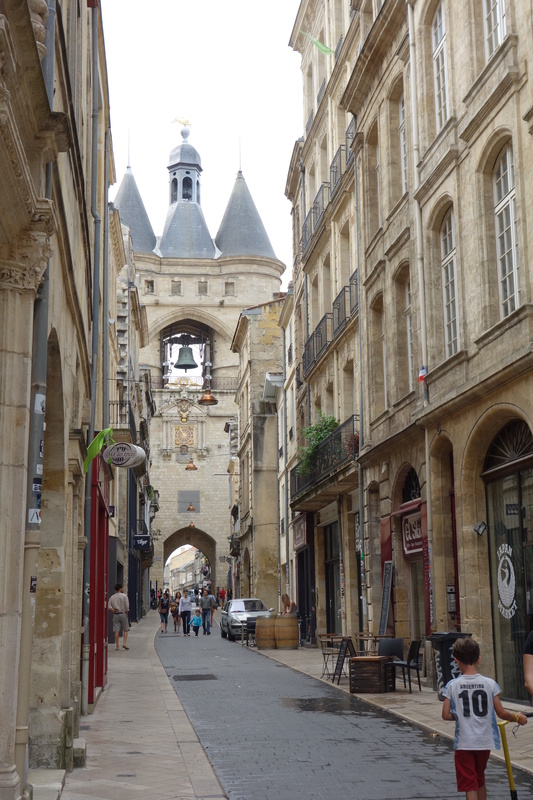 Bordeaux, Week 5: What’s Up with the Coffee? Nothing to do with coffee, but on rue Saint James is a very good café, Books & Coffee, which serves excellent tea. One of the nifty little travel gadgets I brought with me on this trip is an Aeropress coffee maker, available here and, little did I know, apparently everywhere in Europe. It makes as close as you can get to a good espresso without a caffettiera, you know those little aluminum jobbies that once were cheap. In London, Paris, and Bordeaux, you can ask for your coffee beans to be ground for an aeropress and the guy behind the counter won’t look defensive as though you might be cooler than he is. On my usual week-long London layover, the friends I stay with directed my attention to this column in the Sunday Observer by Jay Rayner, the famously cantankerous, common-sensical, “I’m-not-buying-it,” restaurant critic and food writer. He was perplexed by a steady deterioration of the quality of espressos and capuccinos in his city. Why have they turned suddenly acidic? Where are those slightly burnt carmel tones so typical of dark-roasted beans? Answer? The grooviest of coffee houses across London have eschewed dark roasts. Roasting the bean to a deep, glistening mahogany is now considered passé. It does damage to the natural flavor of the bean. A little over five weeks later, I am distraught that I didn’t buy 2 kilos of Blue Sumatra. Or more. How is it that I hadn’t noticed that the French are weenies when it comes to coffee? Have I always brought coffee ground at the Algerian Coffee Store? Have I always bought Italian espresso coffee in the French supermarket Carrefour? Have I simply ordered café au lait in cafés and been distracted by the croissant? In anticipation of running out of my precious dark roasted beans, I started hunting a week ago for a dark coffee bean in Bordeaux. Not French roast, mind you. Those I find too bitter. Just give me an Indonesian bean that’s been on the grill a good long while. I found a very genial coffee bar that sold beans on the Place Pey Berland. The young man and woman who run the place explained to me that dark roasts are bad for the coffee bean. They sold me half a pound of a Brazilian “natural” bean. A day later, after one experimental cup of that purchase, I went to a very cool café near me on rue Saint James (like the infirmary!). There I began to learn that my search would be futile. Every bean in the bins in this town was light brown. Where, I pleaded with the guy, can I find dark roasted beans? He didn’t know. But he steered me in the direction of another shop several streets away on rue des Ayres. There I found my answer. “What about the Italians? I can’t say I’ve ever had a bad coffee there,” I retorted. “Ah, the Italians, pppffft!” Then, he explained that the French have never roasted their beans darker than what I see in bins now. At this point, my French started running out of gas. I wanted to go on to say, oh yeah? Then why did the last two coffee shop people I spoke to tell me they thought San Francisco was a great coffee city, where Peet’s and small artisan cafés reign supreme? But I didn’t. I couldn’t. So, I called my friends in London, who are arriving tomorrow, and asked them bring me a kilo of Blue Sumatra from my favorite coffee shop in the world. S- the link to your favorite coffee shop isn’t working. Thanks, Annie. I think I just fixed it. Loved your post about the coffee. We are completely in sync with everything you said. Of course, is there any better coffee than the rich dark roasted Indonesians? And isn’t the Aeropress the greatest invention since the toaster? I’ve had mine ever since I was introduced to it at a wonderful coffee shop in Florence, Oregon a few years ago. I use it every morning. I must say I’m surprised to learn about the lack of good coffee in France. Disappointing and unexpected. I will never go anywhere without my Aeropress. When I ordered it online, I was surprised to see that a gym equipment company makes it — or so it looked like to me. Great invention. I have a new found admiration for your newsletter layout. I spent four days inputting my contact list, or at least those on my contact list that I think might be interested in reading my in-progress newsletter. The list as it was would not simply upload, so I had to do it by hand. I am using Mail Chimp BTW? Oye! What a mountain of work. I should have stuck with word and photoshop. But, I’ve got four days invested and I’m too stubborn to throw all those hours away. Are you going to email me and say I screwed up by choosing Mail Chimp. I hope not, it might make me cry.